1 . All glass must be paid for in full at time of order. 2 . 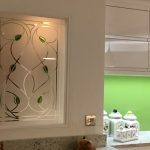 For designs that have not been supplied by the customer, displayed on our Client Pages section or been chosen from our Gallery, all decorative glass designs will be positioned in the centre of the glass unless otherwise stated on order. 3 . We cannot guarantee that toughened glass panels will be perfectly flat because during the toughening process the glass can be warped slightly and this is deemed acceptable in the industry. The sandblasting process can bend the glass slightly. If the glass is not perfectly flat once it is completed, the glass will easily straighten up once installed into the appropriate frames. Customers looking to order frameless glass should accept this fact before placing an order. 4 . 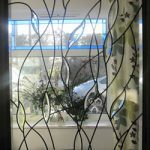 During the sandblasting process it is also possible for normal glass and toughened glass to be bent as described above but the glass will also straighten up when it is fitted into the appropriate window/door frames. We cannot guarantee that the glass we supply will be totally flat. 4a . During the sandblasting process it is possible for small specks of dirt or other foreign objects to land on the glass before the sandblast process and this may leave a very small clear speckle in the finished panel. If this is spotted after a normal sandblast process the panel will be sandblasted again to remove the dot however it is deemed acceptable for one or 2 small clear dots to be visible per panel. 4b . During a gradient sandblasting process if any small areas are left clear after the sandblasting process, the glass cannot be sandblasted again as it will damage the gradient effect so this will be deemed as a unavoidable part of the gradient process so customers must accept that it is possible that a gradient sandblast panel may contain one or more areas of clear marks. 4c . 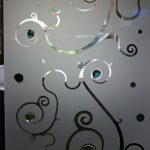 During a gradient sandblasting process the sides of the panel will receive more of a sandblasting effect which may be visible at around 30-40mm from the glass edge. This is due to the glass being blasted more at that position as the conveyor pauses and the gun still blasts whilst the glass is moved towards the blasting gun for the next area to be blasted. 5 . If specific colours are not stated on order with exact colour codes/names, Leadbitter Glass will decide colours to suit the design. If the customer is not satisfied with the finished colours, no refund will be given and the customer must pay for any remakes in full. 6 . 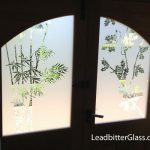 As with traditional decorative glass materials, colour film which is used in all coloured glass projects by Leadbitter Glass can contain imperfections such as speckles of dust in the colour and other marks, grazes and light scratches. Bubbles may also be visible in bevels and fused glass works but these are all part of the manufacturing process so are deemed acceptable in the industry standard. 7 . The colour of lead can vary from batch to batch and even roll to roll so Leadbitter Glass does not guarantee that one glass panel will have the exact same colour of lead as another panel in the same job. The manufacturing process of all colours of lead such as antique can produce a varying colour from time to time and we cannot do anything about this so this is classed as standard practice. 8 . 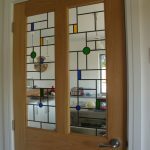 Leaded glass panels are coloured using our Overlay Stained Glass colour films and when installed, any single glazed panels must have the coloured side facing the inside of the home/building. If you do not know which side is coloured, contact the studio for confirmation. 9 Although more than 90% of all courier delivered packages arrive to our customers on time, the ‘Next Day’ service is really classed as a 1 – 2 day delivery by the actual courier firms. We cannot take any responsibility financial or otherwise if a delivery does not arrive to you on time. As a statistic – out of 100 recent packages sent by our studio, we have had only 2 packages not arrive on time so it is very unlikely the package would be late. 10 . The colour of the spacer bar inside of the double/triple glazed sealed unit will be decided by Leadbitter Glass if the customer does not specify a colour on their order form. If you require a specific colour of spacer bar you must state this on the signed order form. 11 . 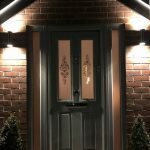 All orders must contain order date, required by date, design name / code, glass & spacer size/type, design colours and signature of person ordering the glass. 12 . 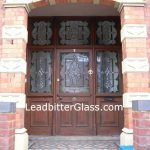 If no mention of specific lead type is supplied with orders, Leadbitter Glass has the right to use whatever lead deemed appropriate for each job. 13 . Fused glass is a hand made product and by its very nature all fused glass products contain various imperfections. Small marks, bubbles, speckles of colours and other imperfections are deemed acceptable in the glass trade. 14 . Almost all decorative glass designs featured on our website LeadbitterGlass.co.uk are owned by Leadbitter Glass and are only available as a finished product by Leadbitter Glass. Legal action will be taken against companies/individuals ordering or manufacturing any of these designs without Leadbitter Glass permission. 15 . Small bubbles will be deemed acceptable in all bevelled panels. 16 . Leadbitter Glass cannot guarantee an exact match in design or colour to previous jobs added to at different manufacturing times. This is due to the manufacturing process of lead, film, bevels and any other materials used by Leadbitter Glass. Colours chosen from swatches may differ from the actual sheet of colour that arrives and this is classed as industry standard and cannot be avoided. Sandblasted panels that are manufactured at different times may also vary. 18 . Most orders will be produced as viewed from outside unless stated otherwise on order. 19 . 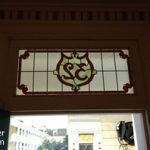 In the case of remakes deemed to be the fault of Leadbitter Glass, we will require the glass to be delivered back to Leadbitter Glass for repair or surveying. We will require the original panel to be returned to us before any replacements are made. The reason for this is the high material costs in the manufacture of decorative glass. 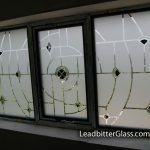 Leadbitter Glass will not pay any fitting costs or delivery charges in the event of a remake being required no matter who is at fault. 20 . Customers ordering double glazed sealed units should be aware that the ‘spacer bar’ will be visible at around 14mm in from the edge of the glass so this must be considered when ordering double glazed units. Not all beading will cover the spacer bar. 21 . 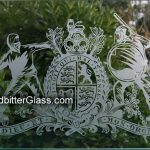 On the Leadbitter Glass order form, the ‘Glass Required’ fields must state the actual glass sizes that you require and not the ‘tight size’. The ‘Glass Size’ must be smaller than the rebate (opening) or it may not fit into the available space. When glass is cut and toughened it is possible for the finished glass to be a maximum of 2mm out in either the width or the height so you must allow for this when measuring your glass. We have a handy guide to help you measure your glass in the Learning Centre section of the website. 22 . For shaped glass (not rectangle), a template must be supplied by the customer in cardboard, hardboard or MDF. This template must be made to the actual glass size required and not the ‘tight’ rebate size. 23 . The different forms of decorative glass supplied by Leadbitter Glass may not react like standard plain glass when chemicals or sealants are used on the glass. 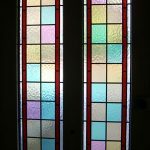 Leadbitter Glass cannot accept any liability for glass that is damaged or stained by the use of chemicals or sealants used during the installation process. The company or individual used to install the glass is responsible for ensuring that all materials used during the installation of the glass are compatible with decorative lead strip, overlay colour film and our sandblasted glass coating products. 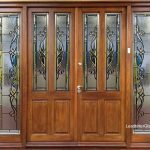 If in doubt, only apply sealants to the plain glass side of the decorative glass and do not apply any sealants or chemicals to the etched side of the glass or the side that has the overlay colour film applied to it. 24 . Leadbitter Glass cannot accept liability for glass that is damaged by the customer during the cleaning of the glass. To get basic information about how to clean your new decorative glass panels once they are installed, please read our Cleaning section in the ‘Learning Centre’ area of our website. The responsibility to select the correct glass cleaners/techniques rests with the person that will clean the glass. 25 If the finished glass is delivered to the customer by courier, the customer must notify the driver of any damage to the package(s) and the customer must record on the delivery note/electrical device, that the package(s) arrived damaged. Any damage must be reported to Leadbitter Glass on the day of the delivery so the package(s) must be opened and the glass must be inspected as soon as the glass is delivered. Leadbitter Glass cannot accept liability for damaged glass that is reported to us at a later date than the date the glass was delivered so it is very important to inspect the glass when it is delivered.